Born in Riga, Latvia, on October, 9, 1902, Galdins join with the Latvian Army in 1919. After graduated from the War Academy, he served as a n officer in the General Staff of the Latvian. After Stalin grabbed his country in 1940 and dissolved the Latvian Army, Galdins served as an officer in one regiment of 181st Division of the Red Army for a short time. During the time, one of his brothers was deported to Siberia. During the German occupation, Galdins joined with the Latvian Legion and served on the Leningrad Front. He was appointed as a battalion commander, and later a regiment commander, in the 19th Waffen Grenadier Division der SS (lettische Nr. 2). 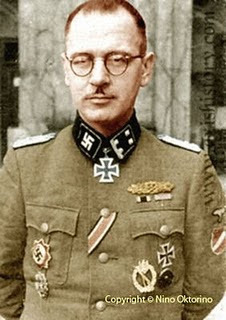 Awarded the DKiG (October 1944) and RK (January 1945) for his bravery and leadership during the fighting in Kurland Pocket, Waffen-Obersturmbannführer der SS Nikolajs Galdins was captured by the Red Army after the German surrender. Sentenced to death by a Soviet military tribunal, he was executed by firing squad in Leningrad on October 5, 1945.